3:12 net +1. Done for the day. Thanks for coming. See you next week. Take a course. 2:58 My Fractal Grid says hang tough. My stop is close. Be patient. 2:26 near 15:00 have the Moon T270, Chiron, Neptune, Jupiter timelines-should add juice. 2:23 holding at the 936 zero degree Chaos Balance point. Time for the fractal grid to kick in. 1:56 Price made it up to the T+315 Moon electric field flux line. Look for price to stick to it briefly before continuing. 1:20 buying 935 stop 931.5 1:10 coming to the Mercury and Node timelines. Watching for some juice. 1:00 Coming into the second trade window. Watching for some juice signaling the end of the congestion. I will let trade 1 ride and do trade 2 independently. 12:38 So far have congested as expected, just like yesterday morning. Short sellers will feel squeezed pretty soon. 12:28 Regular CCT TG noted a fractal up from the outcry low in the chat room. 12:04 trade looking better. 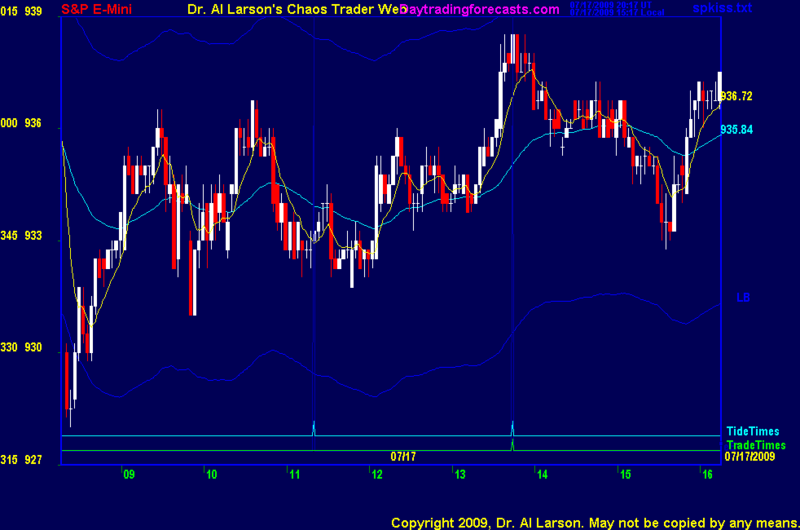 I put a Fractal Grid on the Chaos Clinic 1 day chart, and it says to hold. 12:00 that early hex pattern stabilized prices; at 1300 hit the Sun 0 and Moon 300 time corner of the hex. 11:41 my trade selection software did not pick the 11:20 TideTime as a trade; I added it manually. 11:38 support at 932 is coming from Sun+225 flux. My stop is in a good place. 11:02 stuck in the mud; 440 still up, stop in proper place, so waiting. Trade works or it doesn't. 10:47 the early pre outcry low was on the Moon T+270 flux near 929. Rally of 9 points=45 degrees is 938. British stocks a few times a year. open to those who have taken my 4 main courses. Don't give me all that much credit for MM's knowledge. He's taught me a few things along the way. And he clearly does his homework, keeping a notebook of every trade, why, etc. Great work ethic! 7/17/2009 12:06:14 PM MT TG****:: Nostradamus' interpretation of the Anti-Christ concept is completely different from that of bible scholars. He said there would be 3 of them over time and most who have studied his work believe Napoleon and Hitler were the first two. 7/17/2009 11:41:23 AM MT Al****:: As I recall from the words of Nostradamus, the Anti-Christ comes out of the East. Best fit to any current person is probably Osama Bin Laden. 7/17/2009 11:23:23 AM MT Al****:: gcm: was it written by Nostradamus? or is it some quack interpretation? 7/17/2009 11:11:52 AM MT TG****:: Meant to say fractal grid starting from preoutcry session so would have started mine at same point you did Al. 7/17/2009 11:06:42 AM MT Al****:: gcm: I think it could stall this S&P rally. Red Dragon has it as a high in British Petroleum. 7/17/2009 10:59:21 AM MT gcm:: any expections for Tues black moon& eclipse?